Josh and Antoine remember the feeling. What’s at stake: It’s just as the analysts thought it would be before the season started. The Iron Bowl would feature a team bound for the national championship, while the rival school’s only hope was to somehow manage the upset and spoil their season. Those who predicted an 11-0 Iron Bowl were so bold, so foolish for thinking that one of the schools had even a chance at that kind of success. One team would be grasping, hoping, praying for an upset, while the other tore through undefeated and on their way to Glendale, dominating opponents and national media headlines. It’s just like they predicted it. Right? Well, no, it isn’t. Instead, Auburn is the team that is undefeated, Auburn is the team who has long since clinched the SEC West, and Auburn is the team who has their national championship aspirations on the line. Meanwhile, Alabama, after they were upset by South Carolina (or were they?) and later upset by LSU (or were they?) is on the outside looking in. But I don’t have to tell you what all is at stake here. Analytically, it doesn’t seem like much. Both of these teams’ fates are sealed. No matter what happens, Alabama is going to go to the Cotton Bowl. And no matter what happens, Auburn is going to the SEC Championship Game. I’d tell you what’s at stake in this game if only I knew how — if only I could find the words to describe what this game means, and what this rivalry is. I’d tell you what’s at stake, but you already know. When Auburn has the ball: Alabama’s defense poses several problems. The most obvious, and most notable, lies with their base formation. Alabama runs a standard 3-4 defense, which might not seem so scary on the surface, but is when you take into account that Georgia, a much lesser 3-4 defensive squad, almost completely shut down the oh-so-familiar single-wing Newton option, which has been a staple in the Auburn offense since the LSU game. The unfamiliar defense posed several problems with that particular play: Not just with Newton’s reads, but with the offensive line and their blocking assignments as well. 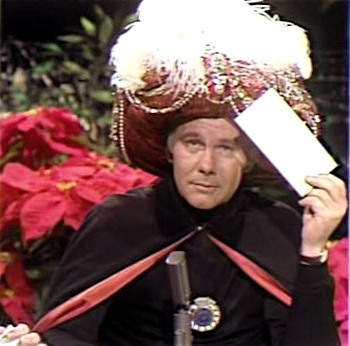 And it’s hard to believe that Alabama’s 3-4 is only going to give Auburn assignment problems with that one play. However, the good news is that Auburn has had three weeks — the Georgia week, the bye week, and this week — of preparation against the formation, and they have a Georgia game’s worth of tape to use to critique and correct. The linchpin of Alabama’s 3-4 is junior defensive end Marcell Dareus, who has had a relatively quiet year statistically, but is always a disruptive force. Behind him is sophomore inside linebacker Dont’a Hightower, who is second on the team in tackles. While the matchup against the front seven and their defensive formations will be interesting, the battle on this side of the ball may come down to the Auburn passing offense against the Alabama secondary. In their secondary, junior strong safety Mark Barron leads the team in tackles, while his counterpart at free safety, sophomore Robert Lester, has been Johnny-on-the-spot with seven interceptions this year, the second most nationally. In fact, Alabama’s defense leads the nation in interceptions this year with 21. The secondary is Nick Saban’s specialty, as well as defensive coordinator Kirby Smart’s, so it comes as no surprise that it is the strongest part of their defense. They throw a ton of different looks at you, but the most curious is the play of their safeties. They like to blitz them, they like to play them up, and, against mobile quarterbacks, they trust them as containment. Expect to see Alabama’s safeties blitzing Newton from time to time, just as they did against Masoli and Jefferson earlier this year. And expect them to dig their heels into the ground and play up on the short passing game. If they choose to do this — if they choose to try and contain Newton’s running game and force him into mistakes underneath — then it will be Deep Ball City for Cam and company, if they’re able to connect. If the Auburn offense plays it right, Adams and Zachery could occupy the defense while the slot guys go for it all. Expect to see a couple of big play chances for Carr and Mario Fannin deep. The chances will be there, but it will be up to them and Newton to make the play. Meanwhile, another one of Auburn’s best threats against the Bama defense will lie with misdirection, just as it did in the 2009 Iron Bowl. Alabama’s defense is fast and flies to the ball, which is exactly what will get them burned by the Malzahn playbook if they aren’t careful. So while the Alabama defense presents several challenges to the Auburn offense, there are also several opportunities there for Auburn to take advantage of. But if the weather was going to have an effect on this game, it would be on this side of the ball. If it’s raining and slippery, Auburn’s deep pass could be rendered ineffective, and a wet turf would favor Alabama here, as it could slow down McCalebb and others on the outside as they try to turn the corner. When Alabama has the ball: This season has been all about the matchups for Auburn, all year long, and especially on the defensive side of the ball. Today, Auburn is in a good matchup against the Alabama offense. 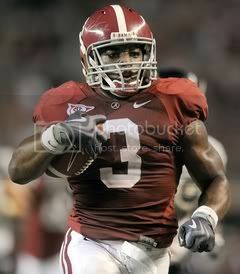 If you remember last year, Auburn was able to shut down Mark Ingram, Trent Richardson, and the Alabama running game. And this year, the Auburn rush defense has improved, while the Alabama running game has regressed. Instead of the power running game that we expected to see from Alabama this season, we’ve seen a quick, almost west-coast-offense-style passing game, where Bama’s power backs get touches in space. Frankly, the entire Alabama rush offense is simply without an identity this year. They don’t even know who their feature back is, let alone how to play with any kind of consistency. Their experiment with the pistol formation and its running schemes has been a failure, and when they want to grind out the clock, they have to default back to the Ingram wildcat rather than running their usual sets. While you can never count out great backs like Ingram and Richardson, Auburn’s defense should be able to contain them, just as it did last season. That being said, the Alabama offense is not without its strengths. The biggest threat they have against Auburn is in their passing game. Junior wide reciever Julio Jones will prove to be a matchup problem for the defense. As you know, Jones is a big, physical receiver, which doesn’t bode well in a set against Auburn’s primary defensive back Demond Washington. It’s my guess that Coach Roof will probably rotate the DBs around throughout the game, just to give Jones different looks and to not allow him to get into a rhythm. Alabama’s passing game under senior quarterback Greg McElroy has been effective, and is one of the reasons why they’ve won as many games as they have this season. Say what you will about McElroy, but he runs a smooth and controlling passing offense that, as with most competent passing offenses Auburn has faced this year, poses a threat to the stitched-together secondary. One of Auburn’s main goals going in defensively has got to be, simply, to tackle. A simple underneath route to Marquis Maze or a screen to Trent Richardson could turn into a huge play with a couple of missed tackles. And, as what seems to be the Auburn defense’s motto this year, they just can’t let them have it any easier than it needs to be. But the Auburn defense does have one advantage against Alabama when they are going to the air, and that lies with the pass rush up front. 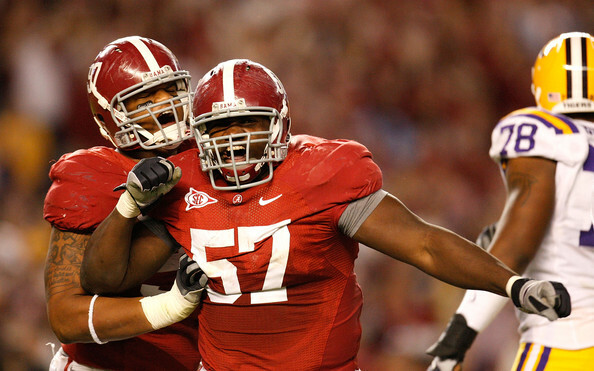 The middle of Alabama’s offensive line is young and banged up, which means big things are in store for Nick Fairley and friends on the defensive line. The SEC’s other premier defensive tackle, LSU’s Drake Nevis, was disruptive and made plays the entire game against Alabama earlier this year. Meanwhile, a successful pass rush has proven key in disassembling the Alabama offense, as was evident with South Carolina’s seven McElroy sacks in their victory over Bama. If Auburn really wants to stop the Alabama offense, they’ll get after McElroy, early and often. Alabama’s greatest strength on special teams is with their punt return team. Marquis Maze has come on as their primary punt returner here late in the season. He’s averaging 15 yards a return, so, yeah, he’s dangerous. But then again, Patrick Peterson of LSU wasn’t all too damaging on punt returns when he faced the Auburn punt coverage. Meanwhile, Alabama’s kickoff coverage team gave up a Georgia State return for a touchdown last week. At some Marriott in Birmingham, Demond and O-Mac are licking their chops. Bama’s kicker is sophomore Jeremy Shelley, who is 10 for 14 on the year. It seems like we’ve been saying this all year, but, yeah, I’ll take Wes Byrum, thanks. It’s the Iron Bowl. There’s a million reasons to worry. 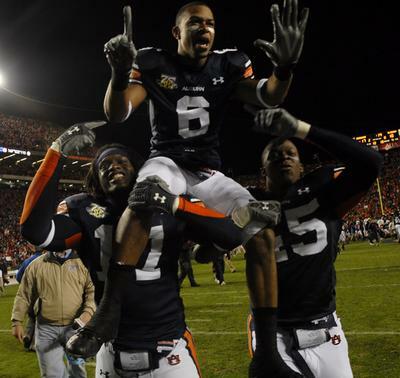 But for me, the most poignant is Auburn’s bye week last week. Besides the fact that with the holiday and the game being on a Friday, it didn’t even really feel like a bye week, it also seemed as if the team was on a roll and clicking on all cylinders two weeks ago against Georgia. Getting the rest after that 11-game grind to start the season was obviously much needed, but it’s possible the bye week could jeopardize that momentum. No other team in college football is more battle tested than the Tigers. Today, there will be a battle. 1. A big day from Daren Bates. Bates’s play is going to be crucial for Auburn today. Bates, the converted safety, is the defense’s speedy linebacker, and is going to be in the best position on defense to make the play on some of Alabama’s short passes and screens. He’s also the go-to linebacker when Roof dials up a pass blitz. 2. Force turnovers on defense. The offense is going to put up some points on the Alabama defense, but it’s going to need some help. The best way for the Auburn defense to do that for their offense is to force turnovers. Success is / failure is: A win / a loss. I want to say it’s going to be a close, hard-fought game. I want to say it’s going to go down to the wire. I want to say that you can just throw the records out when these two teams get together. Because that’s what I’m supposed to say. That’s standard Iron Bowl rhetoric. But that’s not what I think is going to happen. From everything that I’ve seen, that’s not going to be the case. Instead, from everything that I’ve seen and everything that I know, — and I really don’t want to say this — it looks like Auburn is going to win big. Auburn should be able to move the ball offensively, and the defense should be able to do what it does best — and that’s hang in there and play tough for 60 minutes, and give the offense enough to let them take it away. Auburn’s option runs might not be as effective as we’ve seen them, and Newton might let a couple slip away into interceptions, and the defense will probably allow Alabama more than a few big plays, and the crowd at Bryant-Denny Stadium should let Alabama stay in it for some time. But, in the end, Auburn should win convincingly. Auburn rushes for 350+ while Alabama is around 100 or less. Justin, couldn’t you really say Auburn’s been looking at the 3-4 for almost a month? Do you really think they spent the UTC week concentrating on UTC’s defense? I’m willing to bet they were scheming UGA and possibly some of ‘Bama as well. I’ve been feeling this one for a few weeks. I don’t know why. 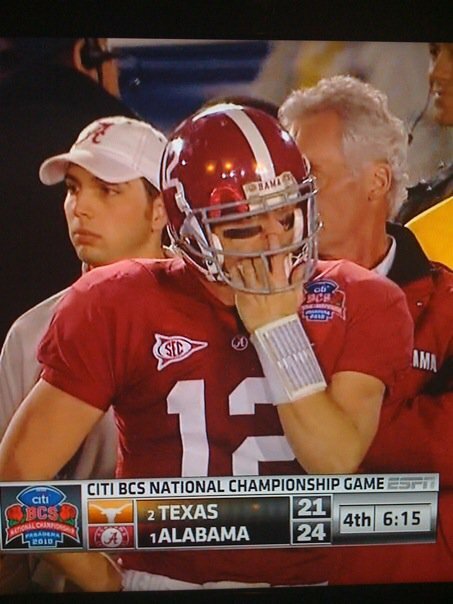 I’ve never really gone into an Iron Bowl (even 2004) thinking we were going whip ‘Bama. But for some reason I just feel really good about this one. I think we win convincingly. It might be close for a while. ‘Bama may jump out to a lead like UGA did two weeks ago, but I think we win convincingly in the end. Auburn Tiger by the grace of God. I love the optimism here…my personal pick is Auburn 27 – Alabama 24. I think it will be very very very close. What’s the most we’ve beaten them by, in the modern era? 10? 37-31 was my prediction in the wishbone column this week. I’m thinking now even closer. Another good one Justin….and I agree with your prediction. I’ll take AU 38-17. The first half will be a little close, with Roof and Malzahn setting up a big second half. pollsters won’t have any doubt about Auburn after this.